A new composting machine is turning students' leftovers at Aberystwyth University into food for plants. BBC Online reports that the Rocket composter can cope with 1.2 tonnes (1,750 litres) per week and takes just 14 days to convert waste from cafes into garden food. Leftovers from kitchens at the students' union and the nearby arts centre are being combined with waste wood to form the compost. The university said the food would normally have been sent to landfill. 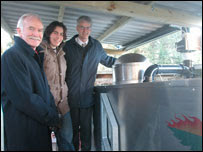 The new machine was bought with a £25,000 grant from the Welsh Assembly Government, and the compost it is producing is being used to nourish plants and shrubs at the university. Pro vice-chancellor John Harries said: "This is the latest in a series of developments that emphasise the university's commitment to enhancing its environmental performance." This is just one of a number of recycling projects the university is involved in.